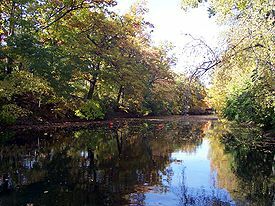 The Red Cedar River is a westward flowing river in Michigan which is a tributary of the Grand River. Its source is Cedar Lake which is located in Marion Township in the southeastern corner of Livingston County, and it runs about 45 miles through Okemos, East Lansing, including the campus of Michigan State University, and finally Lansing where it empties into the Grand River. It has a West and Middle branch, each of which also originates in southern Livingston County. It is not navigable by boats any larger than recreational size, and is not an important shipping route. Its watershed area is estimated at 472 square miles, and it has 12 tributaries of its own. The river is perceived by many members of the East Lansing community to be devoid of life and to be quite dangerous. However, since the national Clean Water Act in 1972, the river has greatly improved and is safe for swimming 74% of the year (the exception usually being right after heavy rains which bring higher levels of E. coli from runoff waters). The Red Cedar is regularly monitored by MSU Water with the contaminant reports posted by the Michigan State University International Center. The river is named for the trees commonly known as "red cedar" that were prevalent and still are somewhat common near the river's source and beginning length. The tree however, is properly a type of juniper, Juniperus virginiana.